By early 1979, the Island had become a mainstay for Houston’s first wave punk scene with bands such as Legionaire’s Disease gigging there regularly. The Disease made even earlier appearances at local Yippie events, including a “Be-In” organized by Henry Weissborn and the UH Direct Action Committee held November 18, 1978, at Lynn Eusan Park on the University of Houston campus; the outdoor event, which included Texas punk legends Really Red, drew a crowd of around 500 supporters. Not long after, Houston’s first Rock Against Racism (RAR) event was planned for April 1, 1979. 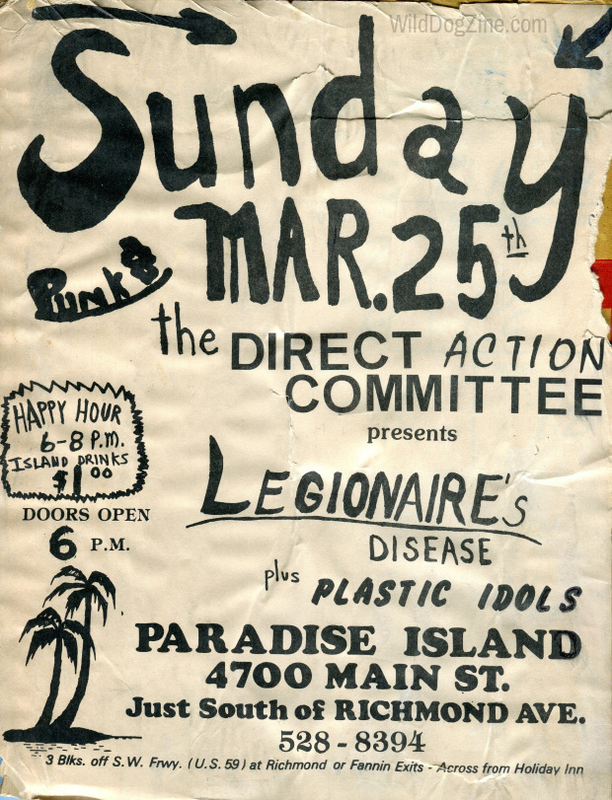 An original flyer promoting a Legionaire’s Disease show with Plastic Idols on the bill lists a date (March 25, 1979) a week prior to this seminal event, indicating that “punk & the Direct Action Committee” were affiliated or had at least banded together for a time. Within weeks of the RAR show, Weissborn reworked the final copy for ULTRA (what would have been a fifth installment), instead launching his first music fanzine, WILD DOG #1, in late April 1979.